Pen and Ink Basics at DVSA! Spring term is underway at the Dundas Valley School of Art. I’m scheduled to teach four one-day workshops and the first took place last Thursday. Pen and Ink Basics is exactly as it sounds. My goal was to introduce the students to the core techniques of pen and ink drawing. We used sketching pens for this workshop as it cut down on overturned bottles of India ink and allowed everyone to focus on the techniques. It’s not all about technique, however. I simply cannot teach drawing without discussing fundamentals and principles. The most important for us on Thursday was ‘light and shadow’. Before we started our first pen and ink exercise, I worked at an easel and presented a few ideas about ‘light and shadow’ and it’s effect on basic volumes. Next, we started on our first drawing; a pear. The students worked from my diagrams/models. Remember that our goal was to gain some fluency with the techniques. The day was not about creating original works of art. I demonstrated the steps one at a time. Where does one begin with a pen and ink drawing? First of all, we decided to use cross-hatching as our technique. That was all very well but what direction should the lines follow? I presented an approach that I call ‘parquet’ and you can probably tell where I got the name. The initial work with the parquet approach looks very mechanical and the emphasis is on overall shape and value rather than stroke direction. As you can see, the first step was only the beginning. We continued to develop the drawing until it gained a three-dimensional quality. We talked about edge versus outline as well as other considerations. In total, we did three drawings over the course of the day. Our second exercise was the ball cap and we used stippling as our technique. 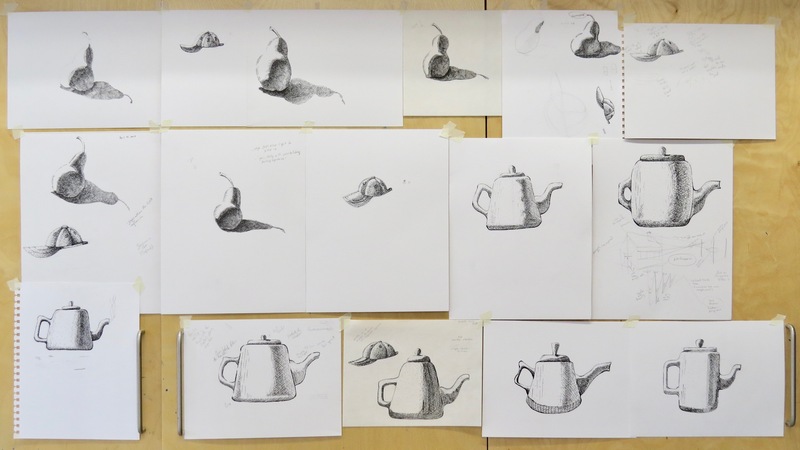 Our final drawing was the teapot. We combined cross-hatching (although not with parquet) with line variety. The students were keen and brought a lot of energy to the projects. We wrapped up with a look at the drawings. Click on the image to view a larger version. 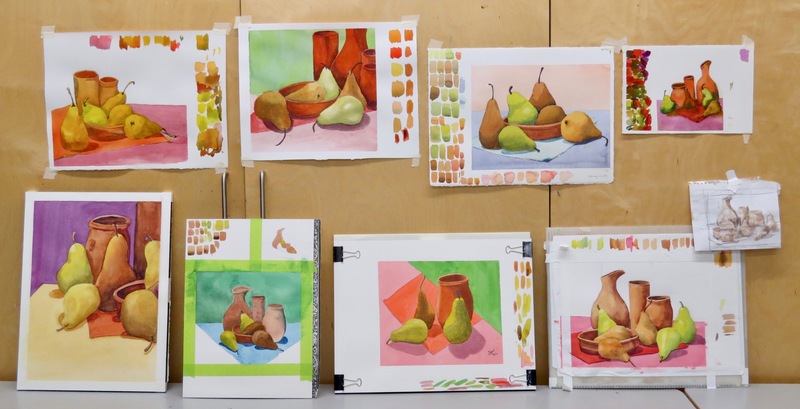 Spring Watercolour Classes at Arts on Adrian – Week One! I’m back from sunny Mexico to some less than welcoming spring weather. 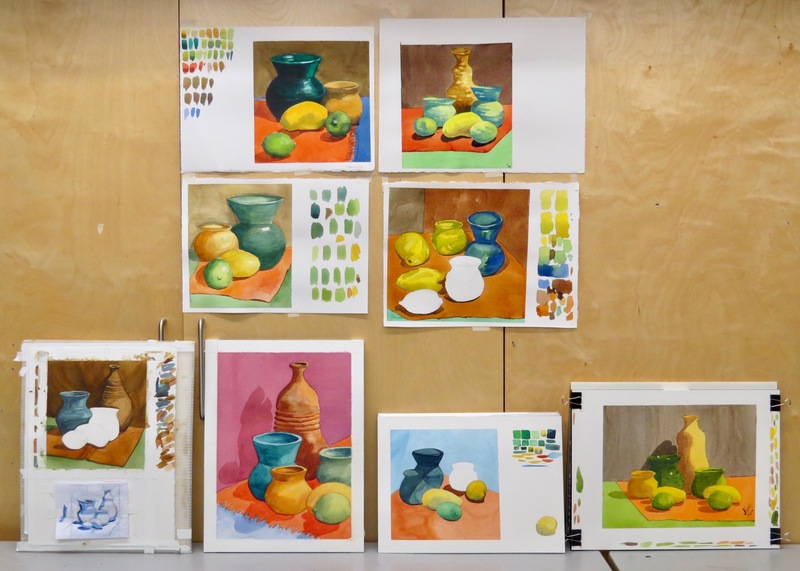 All the more reason to set up a bright and cheerful still-life for the Saturday and Tuesday watercolour students. I had the still-lifes of Paul Cézanne in mind. Cézanne developed his gorgeous, luminous watercolours with brushstrokes of pure colour over a pencil drawing. I didn’t mimic his process exactly with my demonstration but we discussed it as I painted. I never insist that the students emulate my demo but I did ask them to give it a try, even as a study for an hour or so. Saturday is a six hour class so there’s time to experiment and explore. Most gave it a shot and a few spent the day pursuing the approach. Not everyone liked it but they’re always willing to consider new ideas. The Tuesday students worked from the same still-life. It’s a three hour class and, at the beginning, I sensed some interest in the fabrics and folds. My demonstration, as a result, was a simplified study of a section of fabric and they found it helpful. They don’t have a full day but they really work hard and they’re quite good at selecting and composing. Basically, they selected and zoomed in on an area of the still-life that attracted their eye. Not taking on too much gave them a better chance to resolve their work in the time available. Don’t forget to click on a critique image to view a larger version! Winter Wednesday Watercolour Class at DVSA – Week Eight! Our winter term at the Dundas Valley School of Art has come to an end. Two weeks late, mind you, due to the makeup classes needed after a very snowy and icy February. Anyway, it’s March at last and these kid’s rain boots seemed like an appropriate subject. Why not review soft-edge techniques one more time? In addition to that, I showed how I approach the drawing of the objects. Getting the angles right is the key to fore-shortening the boots convincingly. I’ve really enjoyed working with this group of eight watercolour painters. Attendance was excellent throughout and all were present for our last evening together. Gloria had to leave a bit early so here’s a look at her work in progress. Bold colour! Here’s the rest of the work. Click on the image to view a larger version. There was significant progress over the weeks together. Working from direct observation is a time-honoured, traditional practice and it’s not easy! I’ll be back at DVSA this spring. Thanks for following. Next stop; San Miguel de Allende, Mexico! Winter Wednesday Watercolour Class at DVSA – Week Seven! Last Wednesday, I was back at the Dundas Valley School of Art for our seventh class. We should have wrapped up the term by now but our wild and wintery February has us doing makeup classes. Makeup classes, however necessary, can be attendance killers as the students didn’t schedule for them initially. I was very pleased, therefore, when all but one were able to attend. I appreciated, also, that our missing artist called in to say she wanted to be with us but was unable to do so. I’d promised to discuss painting even washes, with no (intended) variation. I spent a few minutes on that before making a quick analysis of how the various objects received the light. I continued to stress a sound process involving a thumbnail sketch as well as lots of colour testing and even a few simple studies of the objects. The students continued to work diligently and thoughtfully and their progress is evident. Don’t forget to click on the critique image to view a larger version. Painting from Photos in Watercolour at Arts on Adrian! I’ve never been an advocate of painting from photographs although I have done it on occasion in the distant past. Let me clarify my thought. I have used photos as reference. My ‘Cubist’ watercolours have always been inspired by memory, imagination, sketches and, at times, some photo reference. My more traditional bird drawings and paintings, however, rely greatly on my own photographic reference. However, I don’t copy photos verbatim and I don’t understand why anyone does so. Technical virtuosity and rendering skills, no matter how sublime, do not necessarily equal art. Many artists do work from photographs, though, and many do it well. An artist is capable of transforming the photographic reference into something personal and beautiful. I prefer the tradition of ‘en plein air’ and direct observation and it’s mostly what I teach. As a longtime instructor, it’s been impossible to avoid the preference many students hold for working from photographs. I decided to deal with the practice by offering a one-day workshop. The participants sent me three photos each ahead of time. I created a PowerPoint presentation so that we could look at them all together and identify potential problems. We broke it down into three categories: composition, light and shadow and colour. First of all, we looked at watercolours from masters of the medium that were all painted without the aid of photographs. Then, we looked at the photos sent by the students. Our goal was to find the essence of the subject. In order to do so, all of the images required some serious consideration. We looked at this lovely snowy scene from Karen W. I made a few suggestions. Eliminate or move the two trees in the lower left corner. Remove the sign or whatever it is in the same area. Lose the wire seen across the roof. Re-design the foliage to show the viewer more of the building. Re-design the trees on the left to deepen the space and suggest a pathway. Karen had a great idea and shortened the roof so it wouldn’t run off the righthand edge of the painting. Our next step was to decide on a format. Most of our pads and watercolour blocks are of a 3 x 4 proportion (9 x 12, 12 x 16). The format was drawn directly onto the photograph and a grid was created. Then, a smaller image, in exactly the same proportion, was drawn and a four-value study was completed. Have a look at what Karen W did. Later on, you’ll see her sustained watercolour in progress in the critique image. Once a small study was completed, the grid was used to transfer the image to a watercolour sheet, in exactly the same proportion! The rest of the afternoon, for the most part, was spent painting. I interrupted at one point for a brief discussion of copyright and ethical issues that often arise when working from photos. Of course, if you always use your own photo you don’t have to concern yourself with these issues. The day went very well. Not everyone was able to finish their work but all went away with a better understanding of the potential problems and pitfalls of simply copying a photograph and the many creative benefits of interpreting their photographic image. Here are a few of the photos that were used. And here are the paintings! Click on the critique image to view a larger version. Karen’s painting is on the upper left. 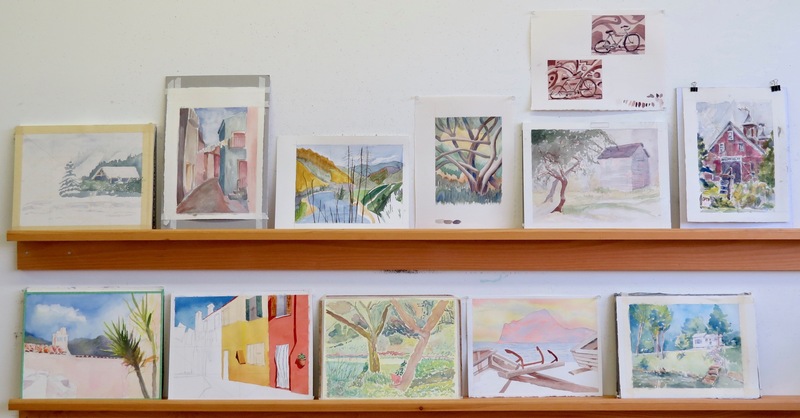 Winter Wednesday Watercolour Class at DVSA – Week Six! Ataulfo mangoes from Mexico. That’s what those yellow things are. A few of the Wednesday evening students were unfamiliar with them so I thought I’d identify them right away. They’re delicious. 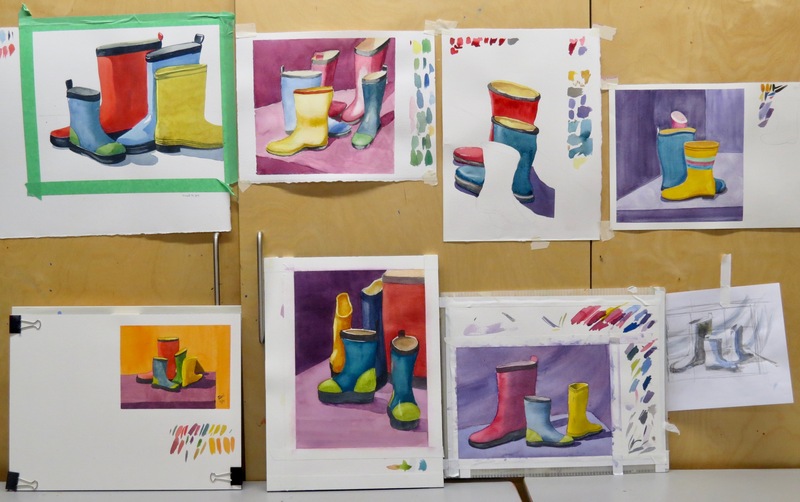 It was week six at the Dundas Valley School of Art last Wednesday evening. Our Mexican theme was a stark contrast to the freezing rain and icy sidewalks and roads outside. I reviewed, as I often do, some soft-edge and brush-handling techniques. I’m very pleased with the progress of this group of painters. I don’t think they need a lot of new ideas but generally require quick refreshers and time to solve the painting problems posed by the still-life. Teaching art at this level (intermediate) is mostly reactive, not prescriptive. This is not a beginner class with a pre-planned lesson every session. Therefore, on the first evening, I don’t know exactly what I will teach on the sixth evening. I need to get to know the group in order to respond to their needs. During the three hours of our class, I circulate and keep an eye on things but I don’t constantly hover. They need to think for themselves. Also, I constantly urge the students to pace themselves by stepping back from their work frequently. Painters need to keep their eyes fresh. It’s very helpful to walk around and see what your fellow painters are up to, as well. We learn from each other in these environments. Every class winds down with a constructive critique. The critique is a very important learning tool and critiques have been a key element of my teaching practice since day one, about thirty years ago. Enough about that, here’s the work from Wednesday night. 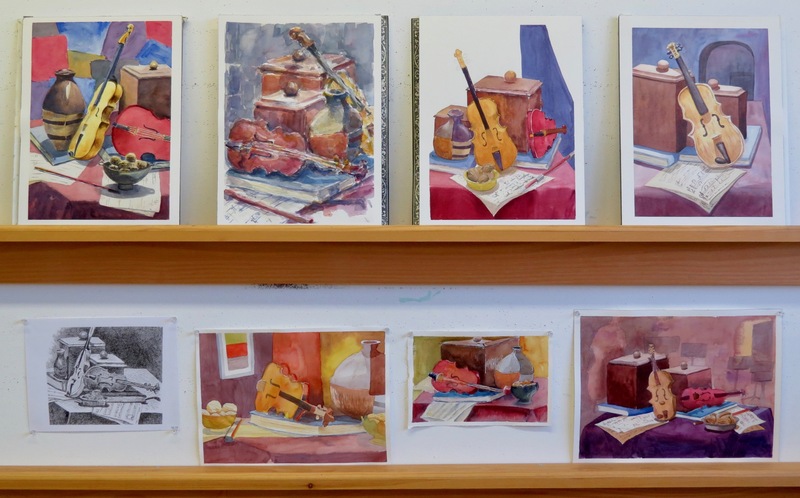 Winter Watercolour Classes at Arts on Adrian – Week Three! The gloves were off this week at Arts on Adrian in Toronto! These strange, sculptural shapes are hockey gloves and they provided many challenges to the Saturday and Tuesday watercolour painters. The first challenge was drawing. I approach all subjects the same way, more or less. I start with very basic shapes. Take a look at the study at the bottom of the demonstration sheet. That’s what my drawing looked like before I refined it as in the larger study. Our next challenge was light and it was a real key to this subject. The gloves are black so we had to keep the lightest areas as luminous as possible. This meant thin washes in those areas; lots of water. Another challenge was black. I mixed my blacks and greys with Cobalt Blue and Burnt Sienna. However, the students were allowed to change the colours, if they so desired. In my demonstration, I painted the different segments of the glove one at a time. The structure of the glove lent itself to this approach. Believe it or not, there are Canadians who hate hockey. I found out who they were as we painted the gloves. Everyone dug deep and worked hard to solve this tricky painting problem. There may have been some frustration but, fortunately, no-one dropped the gloves! By the way, this blog received it’s 245,000th view today. Thanks, as always, for your interest and support. Winter Wednesday Watercolour Class at DVSA – Week Five! Two wintery weeks had gone by since our last class at the Dundas Valley School of Art. Class had been cancelled last week due to a snow day and it was a close call again this week. Fortunately, Wednesday evening was a go and everyone was able dig out their vehicles and get to the school. I kept it simple and fairly brief to start off the evening. I offered a quick review of soft-edge techniques and a few thoughts pertinent to our still-life. Painting time is what this group needed; time to solve the problems and enjoy the process. The students made excellent use of the extra few minutes. I was very pleased with their progress and told them so. One of the students remarked on the overall improvement since week one. I agree and it’s a result of their attentiveness, thoughtfulness and hard work. Winter Watercolour Classes at Arts on Adrian – Week Two! We’ve had some weather! Currently, we’re suffering our second day of traffic tangles and school and business closures due to an ice storm. Last week, a blizzard forced me to postpone my Tuesday afternoon class in Toronto until this week, barely ahead of the ice and freezing rain. Last night, my Wednesday class in Dundas was canceled and a makeup will be scheduled. Anyway, this post from Arts on Adrian is overdue. I found these decorative violins at a thrift shop last December and I couldn’t wait to include them in a still-life. The Sustained Saturday students got first crack at them. This is a capable and experienced group and, rather than discuss techniques, I talked about colour. Often, I find a small colour sketch useful to plan and harmonize the palette for a painting. My demonstration illustrates our discussion. All of the students considered their colours ahead of time and most completed some sort of small study. I was particulary drawn to the simplicity and effectiveness of this one by George H.
The day went very well. I did notice, however, that drawing the violins was a challenge to all and it took a lot of time to do so. With that in mind, I gave the Tuesday students a quick refresher on a sound approach to drawing using basic shapes as a starting point in addition to a brief chat about colour. Everyone enjoyed the still-life and I think it shows in the work. Stay safe and warm out there and thanks, as always, for your likes and comments. Don’t forget to click on a critique image to view a larger version! 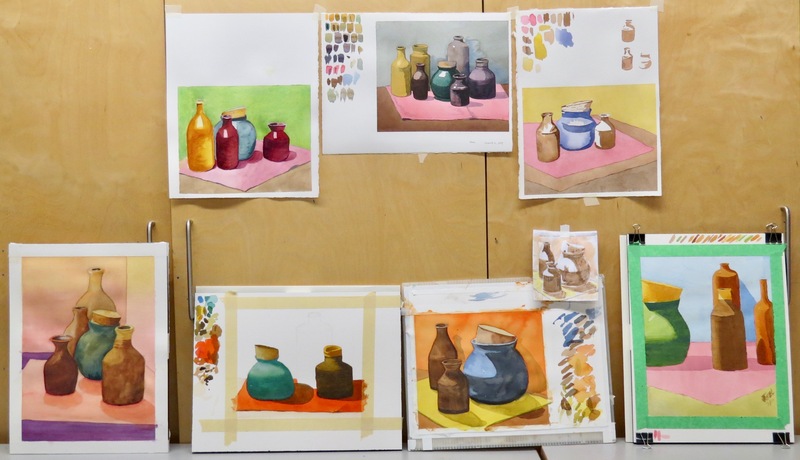 Winter Wednesday Watercolour Class at DVSA – Week Four! 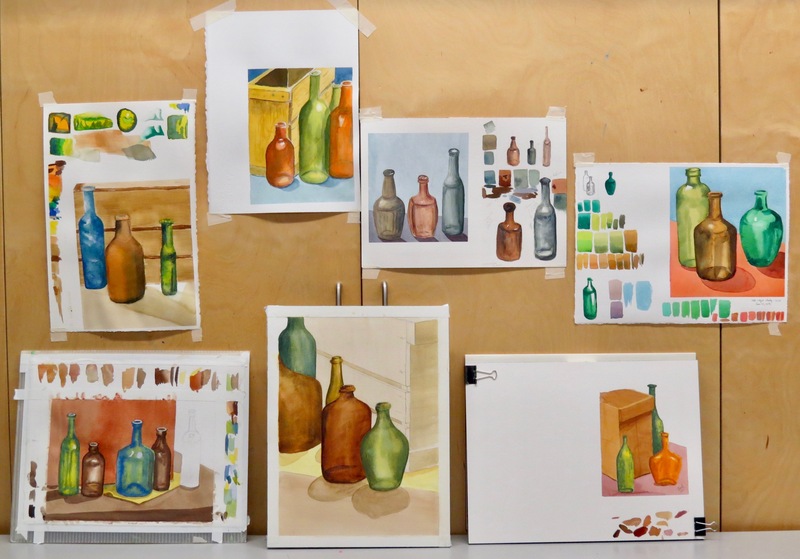 The bottles were empty for the Wednesday watercolour students at the Dundas Valley School of Art. Not even half full, unfortunately. Spirits were high, however, and we used our bottles to continue practicing soft-edge techniques. I did a quick review of the basic approach and then applied the techniques with a few studies. The bottles were first painted by adding dark values to the lighter overall shape while still wet. When the first washes were dry, I added the smaller, darker shapes. These are very clear in the green bottle on the left where the darker shapes all have distinct, crisp edges. In the two brown bottles, I ‘feathered’ some of the edges of the darkest shapes, using a damp brush. This varies the edges of the small, dark shapes and gives the bottle a somewhat more natural appearance. The blue studies, bottom centre, illustrate the feathering technique. This group of students all work thoughtfully and follow a sound process. Practice swatches, small studies and colour testing all lead to more successful watercolour paintings. Have a look and remember to click on the critique image to view a larger version. The contents of this blog are protected by copyright and may not be reproduced without the permission of Barry Coombs. * Three of my acrylics are on display in the current ‘Gallery Artists’ exhibition at Gallery on the Bay in Hamilton, Ontario. The exhibition continues until February 10. WHAT’S NEW and COMING UP SOON? * Join us next March in beautiful San Miguel de Allende, Mexico! Click on the link under Pages. 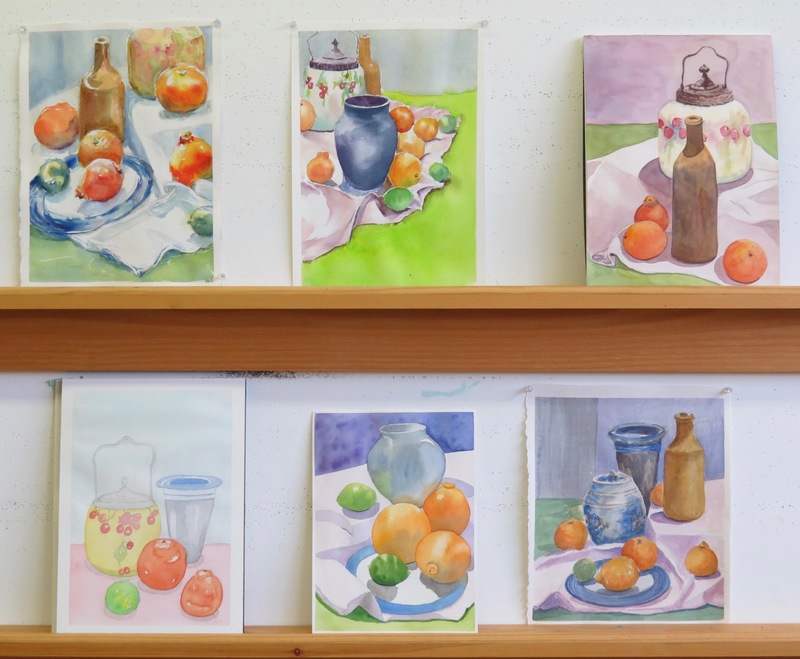 Barry Coombs on Spring Watercolour Classes at Arts on Adrian – Week One! Barry Coombs on More from San Miguel de Allende, Mexico! 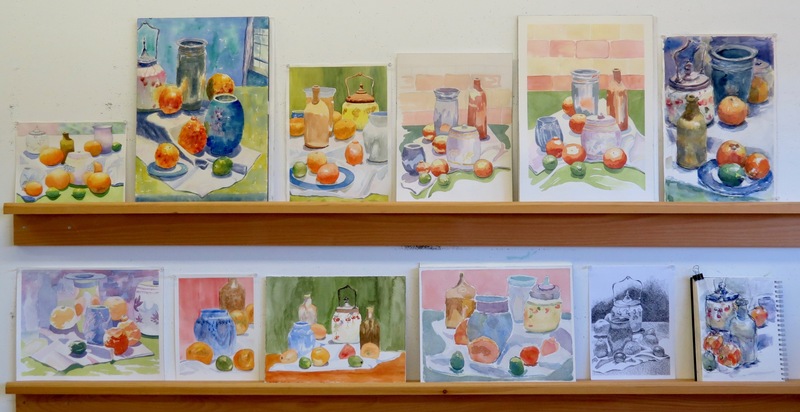 Ruth Bailey on Spring Watercolour Classes at Arts on Adrian – Week One! Lois Buroker on More from San Miguel de Allende, Mexico! Lois Buroker on Hola from San Miguel de Allende, Mexico!